This event, a premier case competition focused on small-cap investment will provide business students with an opportunity to showcase their ability to analyze financial business cases, develop strategic recommendations and apply the academic skills they have gained in the classroom. 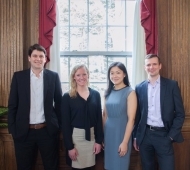 Seeing a gap in the case competition landscape for finance-specific competitions, Concordia University's John Molson School of Business (JMSB) and Van Berkom and Associates Inc. started the Van Berkom JMSB Case Competition in 2011. This event, a premier case competition focused on small cap investment, provides business students with an opportunity to showcase their ability to analyze financial business cases, develop strategic recommendations and apply the academic skills they have gained in the classroom while networking with other business students and professionals in the finance industry. Teams should be made up of 3 - 4 students each, with the option for one alternate member. All nine teams will compete for $6,000 in cash prizes, with first place walking away with a cheque for $3,000.